In December 2012, United Way of Saskatoon and Area convened service providers to Saskatoon’s homeless population - including shelters, health and emergency service agencies, police and housing providers - to develop a cold weather strategy for the community. In 2016 SHIP assumed management of the Cold Weather Strategy. The guiding principle of the Cold Weather Strategy is that no one should sleep outside on a cold night, individual dignity must be respected even in emergency situations, family relationships should be respected and that everyone will work to ensure that individuals and families experiencing or at-risk of homeless are aware of safe, available sleeping options. a new protocol was implemented in 2013 to provide a Cold Weather Alert to police/emergency workers and front-line agencies. In addition to emergency shelter access, SHIP worked to build a list of community partners who would provide “warm up locations” throughout the community. As of last winter, 11 organizations, including the Saskatoon Public Libraries agreed to open their doors as warm-up locations. The Lighthouse Supported Living Inc. and The Salvation Army provide 24-7 access as warm-up locations. 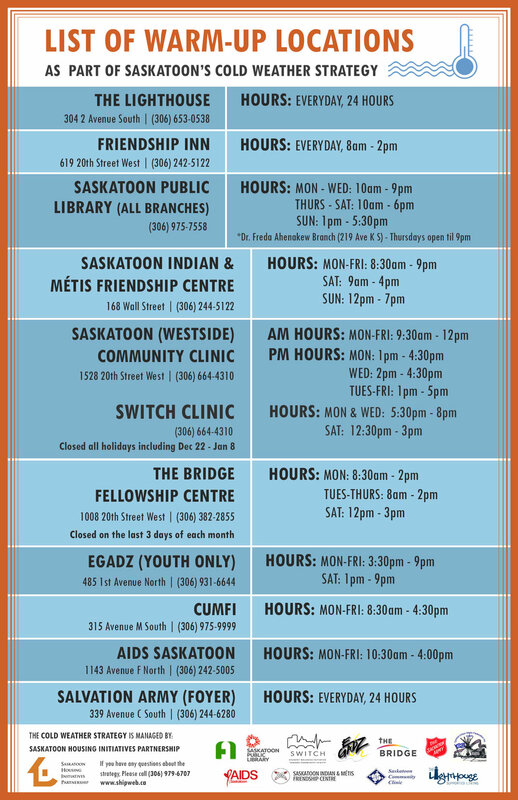 Homeless individuals and families can warm up at the various locations listed here.